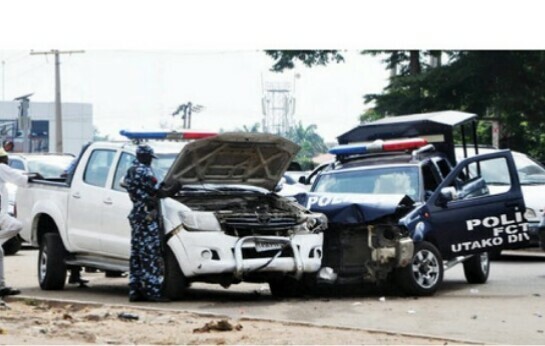 A police patrol team van has collided with another van which was on what looked like a military convoy that was on a show-of-force exercise around the city of Abuja. The incident happened at about 3:30 PM during gridlock at the Jabi Garage traffic intersection, on Obafemi Awolowo Way, Abuja, on Wednesday. It was learnt that vehicles on the convoy were parked beside the Jabi Garage, in front of Conoil, when the patrol van with registration number NPF 133D rammed into the parked Hilux with plate number PF4563 Spy. Miss Chioma Udoh, a pedestrian corroborated the account of Sadiq. She said the crash caused traffic jam at the intersection for about 45 minutes. She, however, said the army personnel on the convoy joined the police to control the traffic congestion. City News learnt that the patrol van belonged to the Utako Police Division. When contacted, the Divisional Police Officer (DPO) of the division, CSP Gbenle Jimoh, confirmed that the van belonged to the division. He directed the reporters to the traffic officer of the division for more details on the crash but the reporters did not meet him in the office.